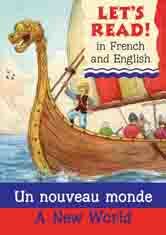 NEW French titles in a new 'Let's Read' series for older children: "Time Twins"., "Danny's Blog"
Children always hear the words as they read them, encouraging good pronunciation. Vivid illustrations make the simple text readily understandable. ...plus carefully designed games using the story to develop language skills. Explore with your class how French written words are pronounced. Children have fun joining in with the story, discovering they can work out what is going on in unfamiliar language. Games and activities help them begin to read and pronounce new words with confidence. They can even try writing their own story!